Probably few people know that invertebrate animals like clams die from cancer or that cancer can cause high levels of mortality in clams from time to time. 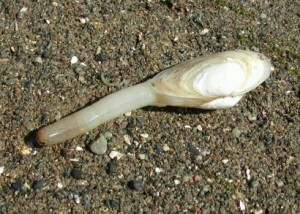 Cancer in the common soft-shell “steamer” clam (Mya arenaria), commercially harvested on the east coast of North America, was first described in the early 1970s. However, a recent scientific paper published in the journal Cell describes a remarkable new discovery about this disease. Most cancers arise from a small genetic transformation of one of an animal’s own body cells such that the cell is able to escape all of the normal controls on cell growth and multiply out of control, leading to vast numbers of cancerous cells invading organs and tissues. The cancerous cells have the same genes as the normal cells in the animal’s body, except for the small genetic changes that resulted in the out-of-control growth. Now, a scientific team from Columbia University in New York and Environment Canada’s Water Science and Technology group in Burlington, Ontario have discovered that the cancerous cells in soft-shelled clams are very different from typical cancer cells. They behave more like parasites than typical cancerous cells. They are actually transmitted like an infectious organism from one clam to another and they grow and cause a leukemia-like cancer in the newly-affected clam. Extensive genetic analysis found that the genes in the cancer cells of soft-shelled clams from places as far from each other as New York, Maine and Prince Edward Island are nearly identical but they are not at all similar to the genes in the normal cells of the clams in which the cancerous cells are growing. Thus, the cancerous cells originated from a single transformed cancerous cell that must have developed in an individual soft-shelled clam long ago. This cell has multiplied out of control and has been transmitted from clam to clam for a very long time. They have spread to affect clams over a very broad area of the soft-shelled clam’s natural range. This actual transmission of cancerous cells from animal to animal appears to be very unusual in nature. Nearly all known cancers are non-contagious and arise anew in each affected individual animal or person by some process of cell transformation. Actual transmission of cancerous cells among individuals was previously known in only two situations: the Tasmanian Devil Facial Tumour and the Transmissible Venereal Tumour of dogs. These two tumours are transmitted between animals during direct animal-to-animal contact. Clams experience no such direct contact with other clams; the way in which cancerous cells are transmitted among clams remains to be determined.